And did you see the AFC and NFC championship games? I sure did. They were great games. One was a blowout. I think the term my brother used was “spanking.” The other was a test of will and probably fate. But nonetheless on Sunday, February 7, 2016 the Carolina Panthers and the Denver Broncos will face off at Super Bowl 50. It’s a funny thing though. While the Roman numeral for 50 is “L”, the NFL decided not to go with the moniker “Super Bowl L” because in their view the “L” wasn’t as “symmetrical” as the symbols X, V and I. I agree. Hey, as in plating a dish, it’s all about the presentation baby. So Super Bowl 50 it is. 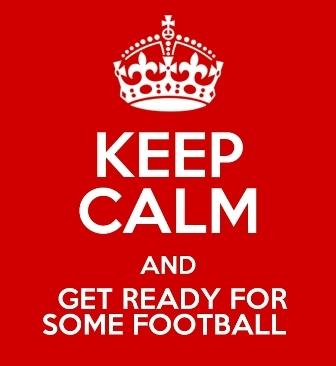 When February rolls around in America, we revel in the long awaited culmination of a hard fought football season. With this being the 50th bowl, it will certainly be a big extravaganza from the dogged exhibition on the field by the two teams left standing to a spectacular halftime show, that will be as much the topic of discussion as the game on Monday morning around the water cooler. As a relatively new viewer of America’s favorite full contact sport, I can’t extol the fine points of how this match up will be a hellavu game. But let’s face it – when it comes to the wild kingdom the outcome of a matchup between a panther and a bronco is pretty obvious – I’m just saying. In Los Angeles we are celebrating another culmination – the end of our football drought. 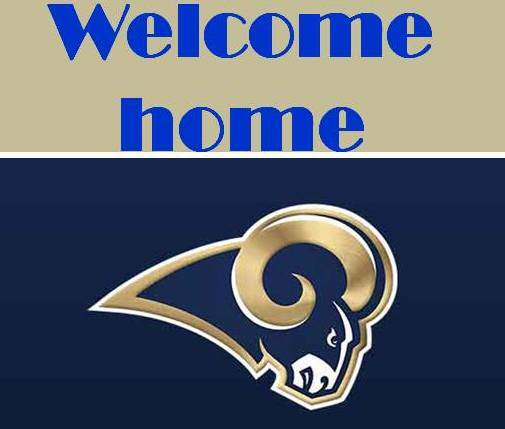 Thanks to an agreement reached by the NFL and its owners, football will return to Los Angeles with the St. Louis Rams coming back home to play their 2016 season in the City of Angels as they await the construction of their shiny new stadium in the City of Inglewood (a suburb in Los Angeles County). And the possibility of the San Diego Chargers making the move to Los Angeles has Angelenos all a flutter too, particularly since it has been 20 years since we’ve had a football team in Los Angeles – now we may have two. The famine is over – feast time is here. But I would be insensitive if I didn’t feel any compassion for the fair city of St. Louis at the loss of their beloved Rams. But then again, my remorse only goes so far because the Rams are simply coming back home. Yes ma’am, yes sir we are not only ready for some football, we are ready for some football in Los Angeles. The “welcome back home” mat has been fastidiously unfurled, their upcoming scheduled has been published and preparations have shifted into overdrive. My wheels are spinning too. So much so that I felt the need to do something special to mark their return, something that would underscore my excitement about football returning to Los Angeles. And lastly, something that would grow to be recognized as a culinary tradition very time the Rams suit up at home or away for that matter. Springing from the something old is something premise – in that the Rams were here and now they are back in a big new way – I created a new take on an old classic. 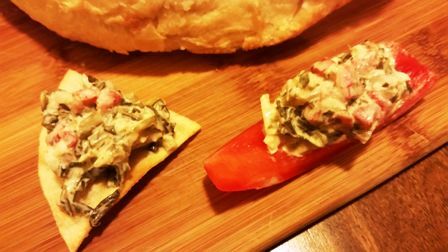 Kickin’ Cali Collard Dip is my latest culinary creation. I am dubbing it the “unofficial party dip” of the Los Angeles Rams. It’s made with collard greens instead of spinach. The use of garlic and red onions compliments the greens perfectly. The crushed red pepper gives it a spark. And the not so secret ingredient that takes it over the top is freshly chopped mint. Yes – fresh mint. You can even add chopped bacon bits, lump crab meat or bay shrimp it you want. Let your imagination be your guide. Serve it with tasty homemade, baked tortilla chips or a medley of sliced bell peppers. You gotta score this recipe. Make it a Rams tradition. 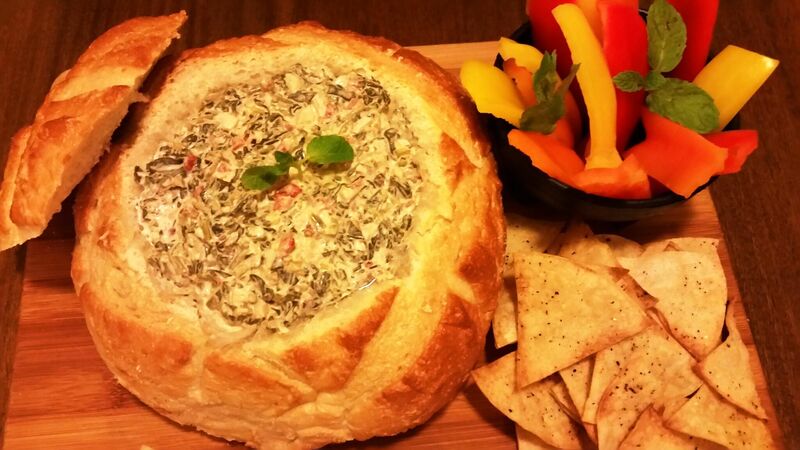 Make it for your Super Bowl gathering. Make it any time. It’s a touchdown in taste. Give it a try and you will see how kickin’ it really is. This entry was posted in Foodies and tagged AFC championship, America, Angelenos, boule, Bronco, California, Carolina Panthers, caviar, Chargers, City of Angels, City of Inglewood, collard greens, Comfort Food, Denver Broncos, epicurean, February, football, football season, fresh mint, garlic, Horse, Inglewood, Kickin’ Cali Collard Dip, LA, Los Angeles, Los Angeles Chargers, Los Angeles Rams, NFC championship, NFL, Panther, Rams, San Diego, San Diego Chargers, sourdough, sourdough boule, sourdough bread, Spinach dip, St. Louis Rams, Super Bowl, Super Bowl 50, tortilla chips tortillas bell peppers, touchdown, Tradition, wild kingdom. Bookmark the permalink.